Another Onepiece lover all zipped up! This is Monica from Norway – home of the OnePiece. This design is on it’s way to the UK in 2011! Who else can’t wait?! So many new designs coming across from Norway throughout 2011, some as early as January / February – we hope! “One early Sunday morning in 2007, Henrik, Knut and Thomas, three Norwegians in their twenties, fantasized about the ultimate chill-out wear that would be perfect for a lazy day at home. And with that the OnePiece Jump in was born. The three friends dropped everything and invested all their savings to realize an idea they believed was unique and brilliant. They made the loose-fitting, all-in-one hooded sweatsuits in soft, thick cotton fleece in a wide variety of colours and patterns. 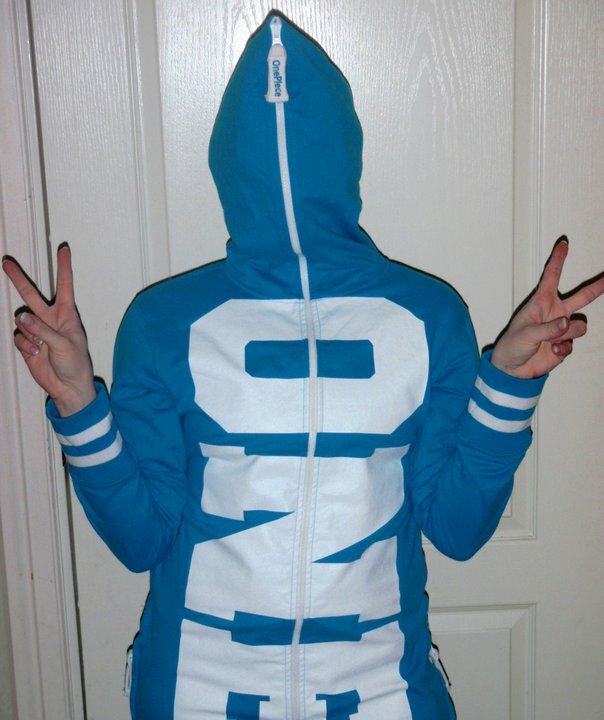 For two years they sold the OnePiece to friends and marketed it to high-school seniors in Norway. Then, in autumn 2009, some bloggers wrote about how much they loved the OnePiece, which triggered other bloggers to rant about how much they hated it. Fuelled by massive debate in social media, the OnePiece Jump in became a huge trend in Scandinavia in 2010, and is now catching on in England and other European countries. Kate Moss, Paris Hilton, David Beckham, Jude Law, One Direction and Sadie Frost are just some of the celebrities who own the jumpsuit. Next postHAPPY NEW YEAR from TheOnePieceBlog! Only a few in stock – get them quick! Don’t forget to ask me for a special deal on it!